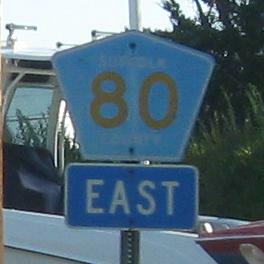 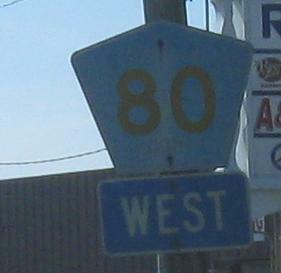 CR 80 ends in downtown Patchogue, but CR 85 doesn't pick up until the western town border. 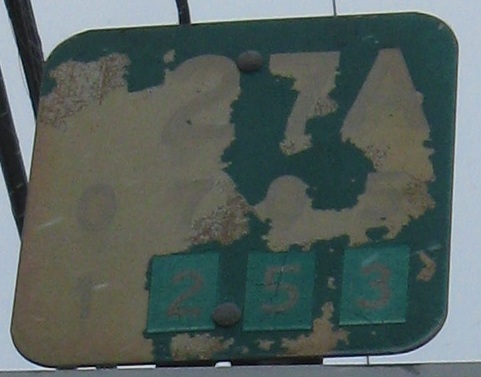 This old reference marker from when the route was NY 27A is WB on that unloved stretch between them. 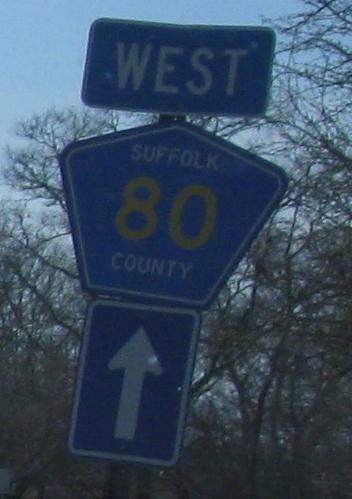 WB in East Patchogue. 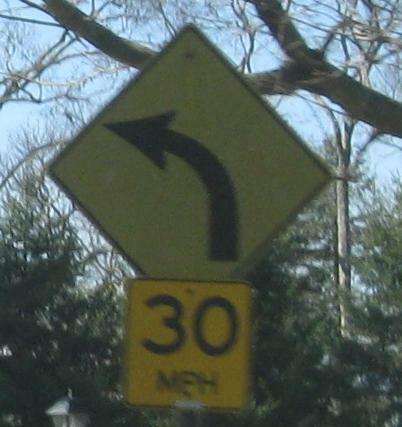 I can live with the wide shields, but please keep the right font inside. 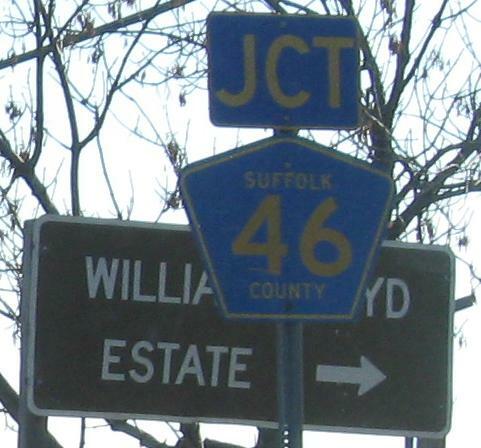 WB up to William Floyd Pkwy., which has the typical wide shield and also the rare correctly proportioned ones, but with the directions on the wrong side. 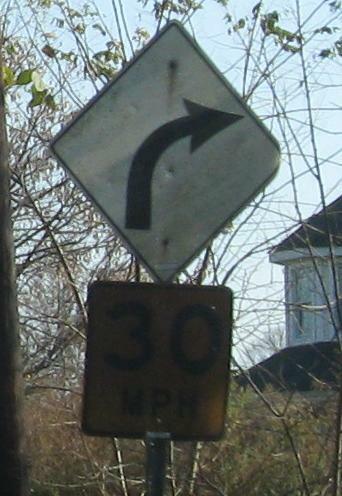 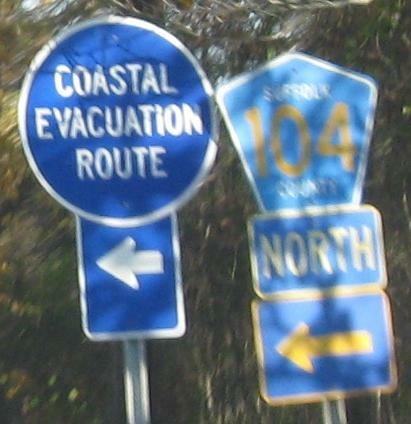 The real story is that curve sign, which dates to the 1960's or early 1970's and was typically only done by NYSDOT. 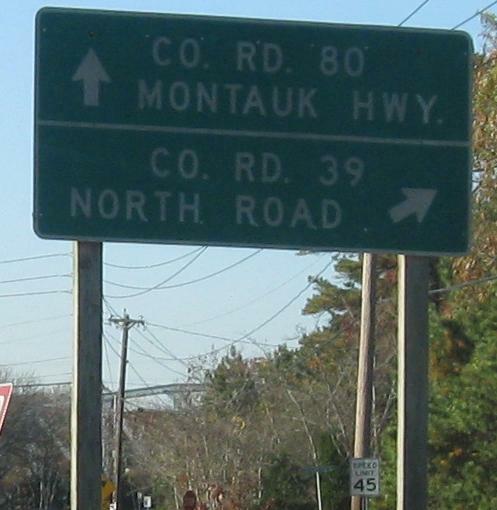 That's back when the entire Old Montauk Highway was NY 27A, and now only a small piece is well to the west. 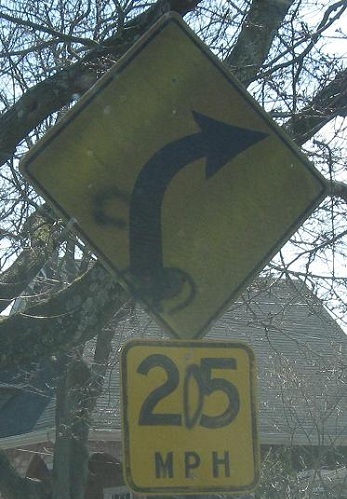 Frowein Rd. 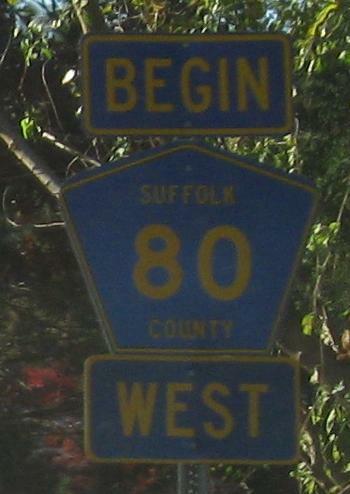 begins in 2009 as a county route and ends in 1975, courtesy Michael Summa, as a county road. 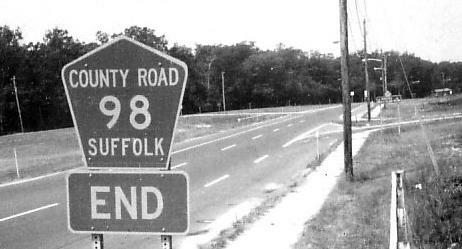 CR 98 begins/ends at CR 80 on both ends, so it's mostly a guess as to which end the black and white photo was taken, but given how shallow the angle is at the western end, I say this is the eastern end. 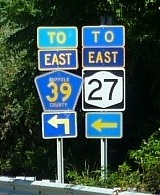 Some more westbound curve signs from the NY 27A days. 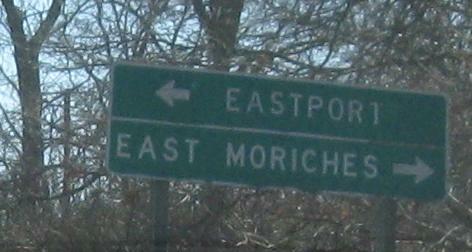 An eastbound duo as well. 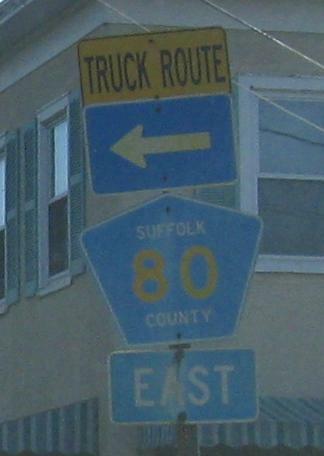 CR 51 SB at its end. 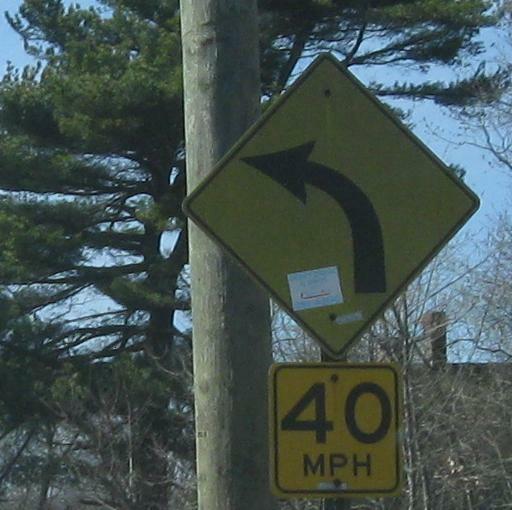 EB again, and one more curve sneaks in. 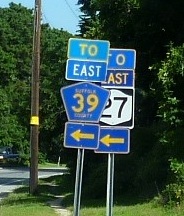 Long ago, the CR 80/104 intersection was NY 27A/113. 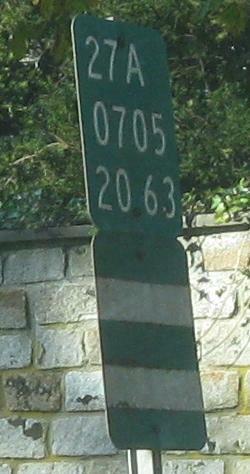 And "North" was on top. 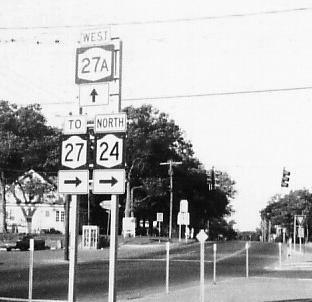 Another 1975 Michael Summa classic, clearly from the NY 27A time period. 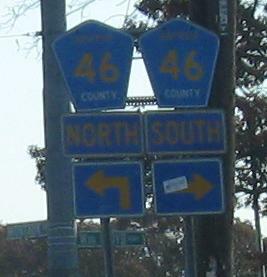 NY 24 still begins here at the county route. 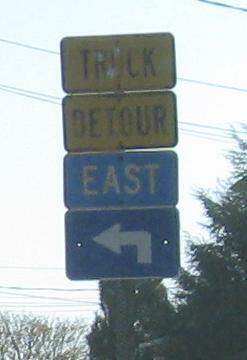 Looking north along the Shinnecock Canal. 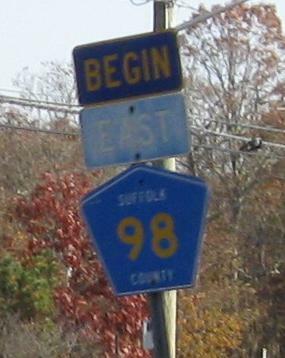 That means everything east of here, including a number of the Hamptons, is technically an island - a manmade island, even. 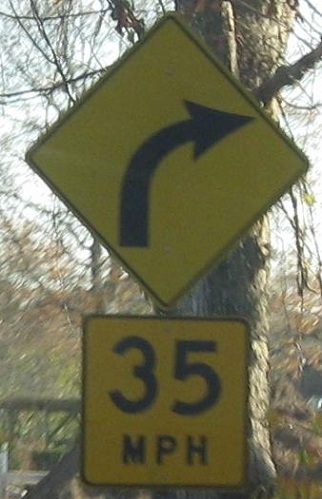 WB on the South Fork. 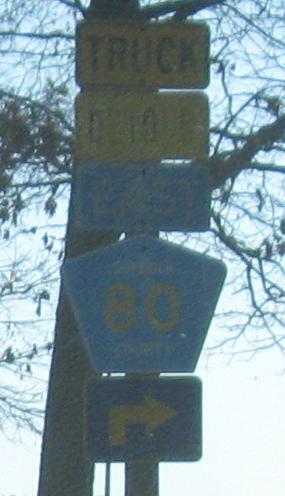 Before CR 80 begins, the road is under town maintenance, so a number of the original NY 27A reference markers are still hanging around. 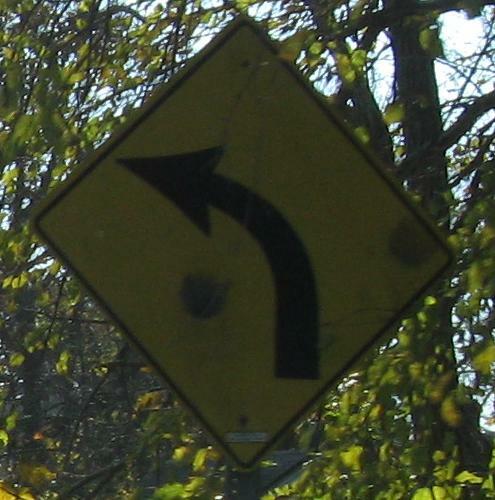 They're not even the old style, demonstrating that the rollback was done well after the 1970's. 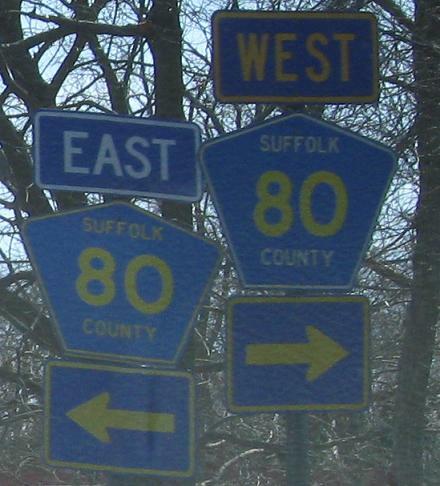 The LGS at CR 39 must date to the exact time that NY 27A was turned into CR 80, because not too long after that, County Roads became County Routes. 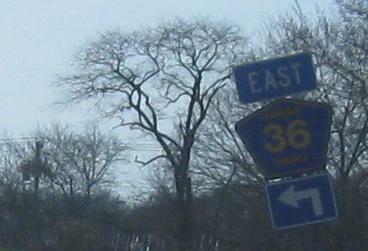 EB at North Rd., courtesy Mike Byrnes. 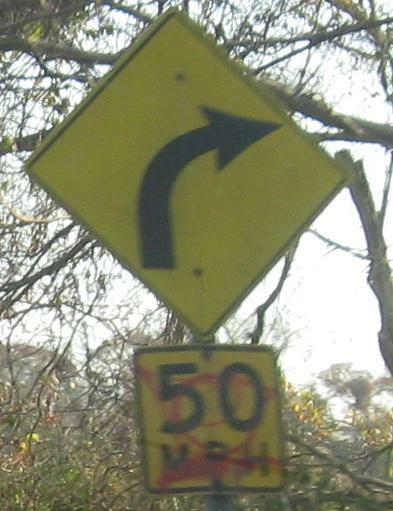 So in addition to all the county-colored signs, we know from the prior caption that this is CR 39, not "TO."